Born in Brisbane on June 27, 1970, John Eales attended Marist College Ashgrove, and played cricket for the school alongside Australian Test cricketer Matthew Hayden. A natural sportsman, Eales also played cricket for Queensland University, before concentrating on rugby with his club brothers, Queensland, and the full Australian international side. A true Australian sporting legend, Eales won two World Cups and played 84 times for his country, 55 times as captain, from the second row, with a further two caps earned at No.8, contributing to a total of 86 international appearances. Nicknamed 'Nobody', because 'nobody's perfect', Eales possessed pretty much every skill the modern rugby player requires. Mobility, fantastic hands, mastery of the set piece, advanced reading of the game, strong defence, a huge work rate, and he kicked the goals to boot. The sight of the big second row lining up kicks at goal always provided a sense of wonder for those watching, but the statistics speak for themselves, with Eales kicking a total of 163 international points, including several match-winning attempts. Not only that, he was thoroughly accomplished as a captain, tactically astute and a shrewd general of his resources, and it is no coincidence whatsoever that his international career ran in parallel with Australian rugby's most successful era. Eales earned his first international honours in 1991, in a 63-6 victory over Wales on his home track at Ballymore in Brisbane. From there, it was on to England for the second ever Rugby World Cup and the rest is history. At that tournament, a 21-year old Eales was a key part of Nick Farr-Jones' Wallaby side that defeated England 12-9 in the final at Twickenham. Australia beat Argentina, Western Samoa and Wales in the Pool stages before knocking out Ireland and New Zealand on their way to the final. In 1999 Eales joined Farr-Jones in that ever-increasing, but highly select group of World Cup winning captains. Eales received the Willliam Webb Ellis Trophy on behalf of the Wallabies from Queen Elizabeth II at the Millennium Stadium in Cardiff, after defeating France 35-12. Australia's capture of the World Cup, which they dubbed 'Bill', was built on outstanding defence and clinical rugby football, brilliantly planned and executed by coach Rod Macqueen and his captain Eales. Much of Australia's success in the late 1990s and early 2000s hinged on this successful partnership between Eales and Macqueen. The clearest indication of this, outside of the 1999 World Cup win, was Australia's retention of the Bledisloe Cup over arch-rivals New Zealand between 1998 to 2002, and the two Tri-Nations titles of 2000 and 2001. Indeed, those two Tri-Nations tournament wins under Eales remain Australia's only successes in that tournament. The No.5 ended his international career in 2001 repelling the challenge of Martin Johnson's British and Irish Lions, playing in all three Test matches, before his final game, fittingly a Bledisloe Cup match in Sydney against the All Blacks. In a period of classic tussles between these two giants of world rugby, this match was another dramatic encounter. With Australia leading comfortably, New Zealand stormed back to take the lead in the closing stages, before Aussie No.8 Toutai Kefu scored a last-gasp try to win the game. Eales retired as the most capped lock in rugby union history, with 84, a record which has since been broken by a number of players, including Fabian Pelous of France and Ireland's Malcolm O'Kelly. He played his domestic representative rugby for the Queensland Reds, making 122 appearances and scoring 402 Super Rugby points, making him the all-time points scorer for a forward in that competition. This period also saw the Reds secure back-to-back Super 10 titles in 1994 and 1995. 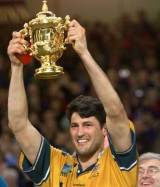 Since 2002, Eales has gave his name to the John Eales Medal, annually awarded to the best Australian rugby union player. Eales was awarded the Order of Australia in 1999 for services to the community and rugby, and post-rugby he pursues a successful business career and remains involved in Australian rugby on a consultancy basis. In 2010, Eales was appointed to the Australian Rugby Union Board following the retirement from the Board of former Defence Force Chief, General Peter Cosgrove. Eales is revered in his home country not just for his exploits on the rugby pitch, but for his diplomacy, level-headedness and good nature away from the field of battle. Indeed, he is the embodiment of that admirable Australian specimen - he's a 'bloody good bloke'.